Ultram is indicated for treatment of moderate to severe pain. It is an opiate agonist and works by changing the way the body senses pain. Patients who are in chronic pain and need around-the-clock pain can be prescribed the extended-release version of Ultram. 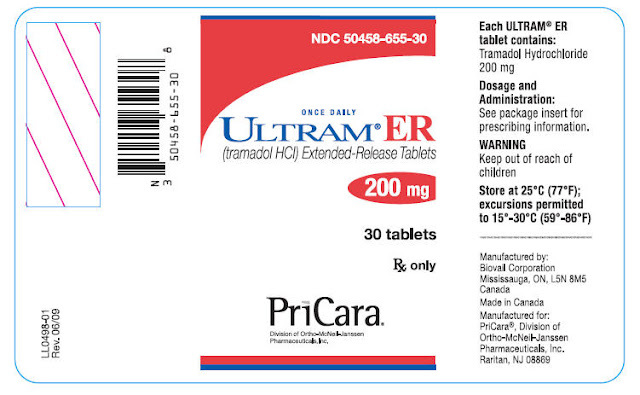 Ultram is prescribed either as a regular tablet or an extended-release tablet. The regular form of Ultram is generally taken every four to six hours as needed for pain control. The extended-release form should be taken once a day, at the same time each day. The physician will generally prescribe a low dose of Ultram and increase the dosage of regular Ultram approximately every three days if needed, the increase for extended-release is done, if necessary, every five days. Never take more than 300 milligrams of Ultram in one 24-hour period. This medication can be taken with or without food. Do take the medication with a full glass of water. Never crush, chew, break, or open an extended release tablet. This could cause the pill to release too much of the drug at one time. Serious side effects or death could result. Seek emergency medical treatment if there is any allergic reaction to Ultram. Symptoms can include hives, difficulty breathing, and swelling of the face, lips, throat, or tongue. Stop taking Ultram and call a physician, if while taking this medication, a fever develops, fast heart rate, hallucinations, agitation, vomiting, nausea, diarrhea, loss of coordination, fainting, overactive reflexes, seizure, shallow breathing, weak pulse, or red, blistering and peeling skin rash. Common side effects experienced while taking Ultram can include blurred vision, flushing, insomnia, nausea, vomiting, constipation, loss of appetite, weakness, drowsiness, and dizziness. Seizures are more likely to occur if Ultram is taken with certain other medications. Do not take this medicine without first telling the physician if an MAO inhibitor or an antidepressant is being taken. Inform the doctor before taking Ultram if taking any of the following; Tegretol, Coumadin, digoxin, Nizoral, erythromycin, rifampin, St. John's wort, quinidine, or any medication that causes drowsiness. Patients who have been addicted to drugs and or alcohol should not take Ultram. They have a higher risk of experiencing a seizure while taking Ultram if there is a history of drug or alcohol addiction, a history of epilepsy or other seizure disorder, history of head injury, a metabolic disorder, or if taking antidepressants, muscle relaxers, or medicine for vomiting and nausea. Ultram has been known to cause impairment to thinking and reactions. Always use caution when driving or doing any type of function that requires a person to be awake and alert.